The Utah Avalanche Center in Logan has issued an Avalanche Warning for all the mountains in Northern Utah, including the Bear River, Wasatch and Western Uintas mountain ranges and the Manti-Skyline Plateau. The threat for avalanches is high on all slopes. The warning is in effect through Friday morning. Already, naturally occurring avalanches have been observed in Providence Canyon near the quarry. According to the Tony Grove Snotel reporting station, over 1 foot of heavy snow has fallen within the last 24 hours, with nearly 2.5″ of snow water equivalent. 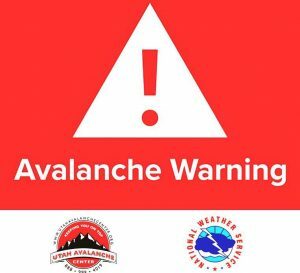 Strong winds along with heavy, dense snow and even some rain on snow in lower elevations have created dangerous avalanche conditions. Travel in avalanche terrain is not recommended. Winter storms are expected to impact the area through Friday. Another round of storms is expected to arrive late next week, as well. 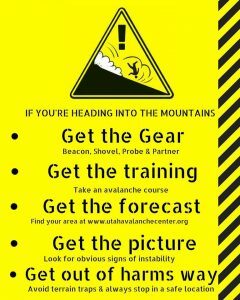 For more information about avalanche safety, and current forecasts, visit utahavalanchecenter.org.